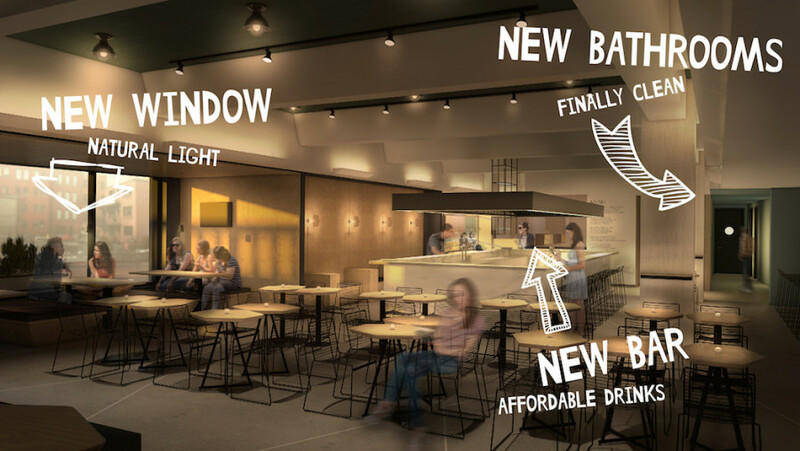 The highly anticipated reopening of Concordia’s student bar could take place this fall if Concordia students vote to approve a multimillion-dollar budget for renovations. In the upcoming Concordia Student Union general elections, undergrads will be asked to approve spending between $1.2 million and $1.8 million for renovations from the Student Space, Accessible Education and Legal Contingency fund (SSAELC). Councillor and former VP of Finance Scott Carr, was concerned that the budget for the project will not be capped at $1.8 million. If costs are higher, council isn’t necessarily obliged to seek approval from students through another vote. That range is an “educated estimate,” according to CSU President Benjamin Prunty. The question is open-ended to give the executive and council some room in case unexpected expenses turn up—but he agreed that it would be unethical if a substantial amount of money were needed. “I think that our organization has integrity, at least this year it does,” he told council. But the project would be delayed if limits were voted on that couldn’t be met. “The expert advice has given us this [estimate],” said Prunty. “This is the most that we can know. Council did approve charging $5,000 to the SSAELC fund to hire a structural engineer to draw up plans for opening the wall to the Reggie’s terrace. The wall will be a floor-to-ceiling window and needs the consultation of a structural engineer not part of the AEdifica firm, which is working on the rest of the renovations. “It should be less, but since we have to bring it to council, we just want to make sure everything is covered,” said VP Clubs and Internal Affairs Katherine Soad Bellini. Meanwhile, the future of the CSU’s for-profit wing, CUSAcorp, is less clear. CUSAcorp has been inactive since Reggie’s closed in October 2013 and the contract with the Java U on the Hall building’s mezzanine expired. The Hive Café opened in Java U’s place and functions as a member-run solidarity co-op, a model that might be applied to Reggie’s. Transforming into a co-op will require student and board approval. These models tend to charge a $10 life-membership fee in exchange for representation in management. Right now, only CSU executives VP Student Life Charles Bourassa, VP Finance Heather Nagy and Prunty make up the board, although there should be four other members. Its activities are currently limited to paying taxes and liquor licenses. If not a co-op, there’s also the option of registering as a non-profit. One thing is for sure: CUSAcorp’s business model needs to change. The company has racked up nearly $1.4 million in debt and its financial management has been called shoddy. The CSU’s unprofitable cash baby is looking at alternatives. Talks with CoopInterface, which helped develop plans for The Hive, as well as with the Concordia Small Business Consulting Bureau, are ongoing. A business proposal is expected to cost about $13,000. The Concordia Small Business Consulting Bureau is managed by a group of MBAs from the John Molson School of Business. The proposal should include the details and guidelines CUSAcorp will need to operate a successful student bar that serves food and is open for events. The new Reggie’s will have its own kitchen, separated from The Hive, and should dedicate one tap for a local brewery like the Coopérative des brasseurs illuminés. The majority of renovations are due to the new kitchen, which will need a proper ventilation system, the new glass wall, and rearranging the bathrooms (both The Hive and Reggie’s will have their own). Changes to décor also mean a new stage for shows and events, updated furniture and more seating.